According to the Synaxarion of Constantinople, on May 5th we commemorate the Consecration of the Church of the Most Holy Theotokos in the Kyrou district of Constantinople. 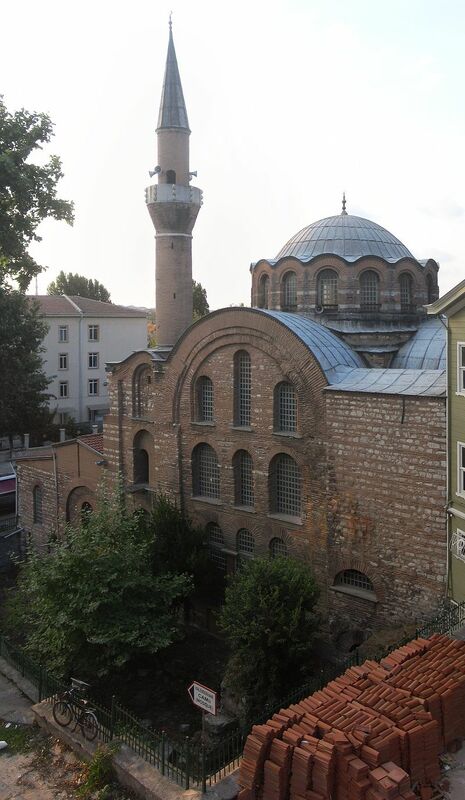 Today it is believed the Kalenderhane Mosque is the location of this church. The fourteenth-century ecclesiastical historian Nikephoros Kallistos Xanthopoulos tells us about the history of this church and its association with the kontakia of Romanos the Melodist. He says that Saint Romanos the Melodist was appointed as a deacon in this church of the Kyrou district, though he was initially completely unrefined and unpleasant in his voice and in the singing of hymns. For this he was mocked by many, despite being esteemed for his virtues. Distressed by this, Romanos, after a Christmas Eve vigil at Blachernae, went to the Church of the Most Holy Theotokos in Kyrou, and begged the Theotokos before her miraculous icon to grant him the gift of melody. Falling asleep near the ambon, at around midnight he beheld the Theotokos holding a scroll, which she gave to him to eat. Having consumed it, he received his desired gift, and ascending the ambon, sang the kontakion "Today the Virgin". Later he went on and became the composer of over a thousand kontakia. Xanthopolus further writes that the reason this district in Constantinople, where the Church of the Theotokos was built, was called "Kyrou" stems from one of Byzantium's most noted philanthropists and builders, Cyrus of Panapolis (Kyros is Cyrus in Greek), who was a Roman official during the reign of Emperor Theodosius II (408–450). Before the church was built, a pious person hid an icon of the Theotokos in a cypress tree. Later, in a miraculous manner, the light of a lamp would shine from this cypress. For this reason, in the midst of all the various renovations Cyrus of Panopolis was making in Constantinople, he also had this church built and consecrated to house the miraculous icon of the Theotokos. Since then the church was associated with his name. It should be noted also that Cyrus was admired in his own day for being a poet, and replacing the common use of Latin in his official affairs with that of Greek. This makes it seem more appropriate that Romanos would receive the gift to master the kontakion in this church built by a renowned poet. Cyrus reposed in 457, a century before Romanos the Melodist who reposed in 556; it is believed this church also contained relics of Saint Romanos. In other sources we find that the icon of the Theotokos in Kyrou, which was also known as Panagia Kyriotissa, was the source of many miracles and was one of the few shrines in Constantinople, renowned for its relics, that pilgrims flocked to especially to venerate a miraculous icon. Thus Niketas Choniates reports the dream of a certain Mavropoulos in which he saw the icon of the Theotokos in Kyrou imploring the military saints to protect Constantinople, but finds them unwilling to do so. 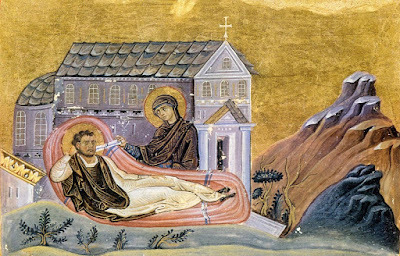 And among the miracles of Saint Artemios there is the incident of an ailing child who was cured in the Church of the Theotokos in Kyrou, and when Saint Artemios appeared to the mother he said: "Christ our God, born of the Theotokos, this very One heals you."